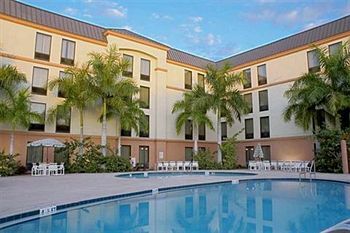 Hampton Inn St. Petersburg is located at 34th Street and 12th Avenue North. We are within close proximity to downtown area businesses, beaches and attractions with fast and easy access to I-275 and the Sunshine Sky Bridge going to Sarasota-Bradenton. Area attractions include Sunken Gardens, museums, the Pier with shops and dining, Fort DeSoto Park with beaches, picnic areas and old fort, and water cruises. Within 1 mile you can dine at Kissin' Cuzzin, Texas Cattle Corp., Po Folks, or Sam Whoa. We feature 130 rooms, meeting space for up to 50 people, exercise gym, outdoor pool, and RV/boat parking. Amenities include complimentary continental breakfast bar, in-room coffee maker, and TV with cable. We also offer connecting rooms, cribs, hair dryers, irons, and refrigerators. Laundry/valet services, guest/laundromat, meeting/banquet facilities, and audio visual equipment are available for a nominal fee.